A Mushroom with a bee's yellow and brown stripes over its cap. Turns Mario or Luigi into Bee Mario or Bee Luigi. 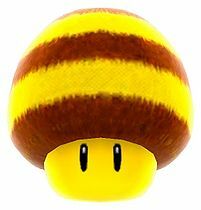 The Bee Mushroom is a yellow mushroom with brown stripes on the cap which acts as a power-up in Super Mario Galaxy and its sequel, Super Mario Galaxy 2. The mushroom is first found in the Honeyhive Galaxy after collecting a ? Coin. It is also found in Super Mario Galaxy 2 in a few other galaxies. Once Mario or Luigi collect the Power-up they will become Bee Mario or Bee Luigi and will then be able to fly for a limited time, climb honeycomb walls and cling to the Queen Bee. Bee Mario is also uniquely capable of standing on flowers and clouds. By collecting a coin, Bee Mario and Bee Luigi can fly a little longer. If Mario or Luigi touch water when they have on their Bee Suit, they will go back to their normal form. It also appears in the Honeyclimb Galaxy, Gold Leaf Galaxy, Sea Slide Galaxy and Sand Spiral Galaxy. In Super Mario Galaxy 2, it appears in the Honeybloom Galaxy and the Honeyhop Galaxy. Also, once Mario or Luigi gets 120 Power Stars, a Bee Mushroom will appear in the Tall Trunk Galaxy in the ending credits. The Bee Mushroom appears in five galaxies in Super Mario Galaxy, Honeyhive Galaxy, Honeyclimb Galaxy, Gold Leaf Galaxy, Sea Slide Galaxy, and Sand Spiral Galaxy. The Bee Mushroom makes its debut and introduces the player to the mechanics of the mushroom in the fist mission, Bee Mario Takes Flight. It also appears in the third mission, Big Bad Bugaboom, where it is used to help the player's fight against Bugaboom. The Bee Mushroom appears again in this galaxy's only mission, Scaling the Sticky Wall, which makes the player climb a series of honeycomb walls. In Star Bunnies on the Hunt, the Bee Mushroom is used to retrieve some blue Star Chips for some Star Bunnies. It returns in the second mission, in which it is used to get extra height from a Cataquack's hurl and obtain the Power Star. It appears for a third time in When it Rains, it Pours, and it can be used to help fight the boss. In this galaxy, the Bee Mushroom is first used in the third mission, and it has a minor role in getting one or two of the Silver Stars. It reappears in Purple Coins by the Seaside, where it helps the player fly from cloud to cloud collecting Purple Coins. This galaxy's only mission, Choosing a Favorite Snack, has Mario or Luigi choose between a Bee Mushroom and a Boo Mushroom to get down a hazardous corridor. In the sequel, the Bee Mushroom appears in two more galaxies: the Honeybloom Galaxy and the Honeyhop Galaxy, and also appears in the credits in a scene from Tall Trunk Galaxy. The Bee Mushroom appears in Bumble Beginnings, and lets Mario travel on the flowers that you need to complete the level. It also helps the player get this galaxy's two Green Stars. The powerup returns for a final time in The Sweetest Silver Stars, and it plays huge help in acquiring the five Silver Stars. The Bee Mushroom is also needed to get both of this galaxy's Green Stars. In Mario + Rabbids Kingdom Battle, a tube of honey with a Bee Mushroom design on it appears in the level Unlikely Heroes and near Peach's Castle. If the player uses completely the Bee mushroom at the Freezy Flake Galaxy in the credits, right when the scene switches, the player can possibly lose a life. This can be considered a glitch. This page was last edited on June 24, 2018, at 08:27.